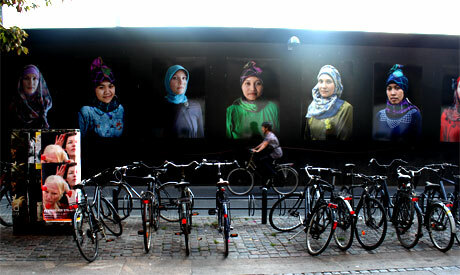 Danish artist Katrine May Hansen questions the meanings behind head scarves by juxtaposing Indonesian and Danish cultures in an outdoor exhibition in Copenhagen. “Is a scarf really just a scarf? How did the Hijab become such a symbol in Denmark that it sometimes even keeps us from communicating with each other?” asks Danish artist and writer Katrine May Hansen in the notes accompanying her outdoor project titled ‘A Scarf is A Scarf is A Scarf’. The exhibition, which forms part of Hansen’s Heart2Heart tour, was undertaken in collaboration with photographer Dot Severine Nielsen, and presents photographs of women wearing a variety of head scarves. 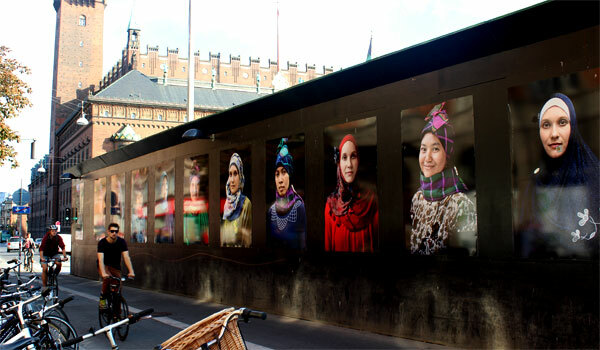 Launched in April 2013 and continuing throughout October, the photographs are displayed along a wall at Vester Voldgade Street, in the vicinity of Copenhagen’s historic City Hall Square. The large portraits look into the cultural and historical connotations behind head scarves and analyse a relationship between head scarves worn by women at the Danish island of Fanø in the North Sea and the Indonesian island of Java. While, for some cultures, a scarf defines traditional and religious affiliation, to others it might be just an occasional accessory. Illustrating this point is the fact that Indonesian women wear scarves as an integral element of their outfit and Danish women often include exotic scarves in their daily dress. Scarves differ in pattern, material and draping, depending on the cultural background of the woman wearing it. “We all know the things that can separate us – culture, religion, history. But some things we share. Not so long ago the head scarf was a common sight in Denmark,” Hansen writes. Hansen’s photographs switch the roles to consolidate the point: women from Fanø are featured wearing traditional Hijab styles while modern draping and decorative patterns are given to the Indonesian women. Hansen tried to develop a dialogue between faiths while challenging the stereotypes we choose to formulate. She points to the distance we tend to create by looking at wardrobe and appearance, and the consequent generalisations built upon them. Hansen’s experiment of switching the scarves invites the viewer into an important revision of how we create our perceptions and judgements. Can this exchange of scarves shake the viewer’s classification of historical, traditional, social and religious elements that we tend to attach to clothing, either consciously or subconsciously? What are the gains resulting from such an experimentation with our perceptions? Is there a difference? Seemingly simple portraits look at the hundreds of people rushing across Copenhagen’s city centre. But as people stroll by and ride their bikes along the long wall, they are greeted by the warm and often smiling faces of women from Indonesia and Fanø who leave an unforgettable imprint. Born in 1979, Katrine May Hansen is a Danish writer, poet and playwright, writing in both English and Danish. She is an established voice (and face) on the Copenhagen literary underground scene. According to Hansen’s online biography, she is the founder of Lovetrust, a company hosting cultural and artistic meetings on a global scale, as well as lectures and talks. Hansen has also launched the Heart2Heart Peace project, an initiative to practice peace among different religions. The Kingdom of Denmark, as per 2011 figures, counts 5.5 million people, 3.7 per cent of whom are Muslims – constituting the largest minority in Denmark – hailing from various origins. Among these Muslims are women, who choose to wear a traditional scarf and, as such, are an integral and obvious part of Danish society.